These beautiful seals may date from Middle or early Late Minoan times, and if this is so, they were fashioned when Minoan Linear A was still in use. Otherwise, if they date from Late Minoan III, the script in use would have been Linear B. 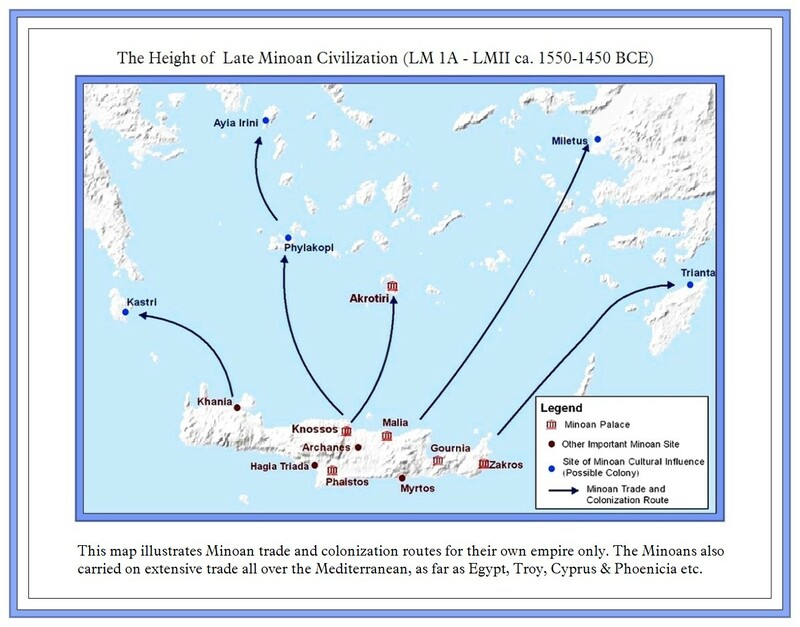 It was over the last half of the sixteenth & the first half of the fifteenth century that the Minoan civilization made the swift switchover from using the as yet undeciphered Linear A syllabary to writing Mycenaean Greek in Linear B. Whether or not Knossos itself was conquered by the Mycenaeans around 1500 BCE is a question entirely open to conjecture. Many historians are quite convinced it was, but I personally am not so convinced. However, you should take my opinion with a large grain of salt, as I am a linguist and not a historian! The largest Minoan palaces after that of Knossos, the capital city of the Minoan Empire, with a population estimated to have been somewhere around 55,000 (a huge city for the Bronze age!) were those at Phaistos & Zakros. All of the palaces illustrated on this map have been thoroughly excavated, and they have yielded inestimable treasures of Linear A & B tablets, magnificent Minoan frescoes and art, bronze ware of all sorts (weaponry, utensils etc. ), pottery and so on. If you have already had the opportunity to visit any of these magnificent sites (as I have, seeing Knossos in May 2012), you will know to what heights the Minoan Empire and their highly cultured civilization aspired. They (the Minoans) were so cultivated and refined that they virtually outclassed and outshone all other contemporary Bronze Age empires, and that includes, to my mind at least, Egypt! In fact, the Mycenaeans, shortly after arrival at Knossos, imitated lock-stock-and-barrel, the brilliant architecture and the entire repertoire of military expertise, the arts and crafts and every other area of the prosperous Minoan agri-economy. Their tribute to the Minoans could not have been more profound than that of the Romans to the Greeks some 1,000 years or more later on. It was that kind of phenomenon, nothing less. This is the very first Linear B tablet deciphered by Michael Ventris in 1952. So in honour of his name as a superb linguist and genius of the first order, I now present you with a totally new version of this historic tablet, which I have reformatted for the greatest possible clarity, with the intention to make this tablet all the more accessible to students of Linear B who wish to translate a tablet into English. It should come as no surprise that of all the extant Linear B tablets, this is the one most often translated. I will be providing a complete translation of Pylos tablet TA 641-1952 later this month.